« Mulberry: when should I transpant it? Conference Pear – ripening the fruit? Please can anyone suggest how to successfully ripen Conference pears? The pears have reached considerable size on the tree, but are as ‘hard as bullets’. So far I have had suggestions of picking them all, and placing bananas amongst them(? ), and just leaving them on the tree. Will the tree be OK if they are left, as they are hanging low under the weight? 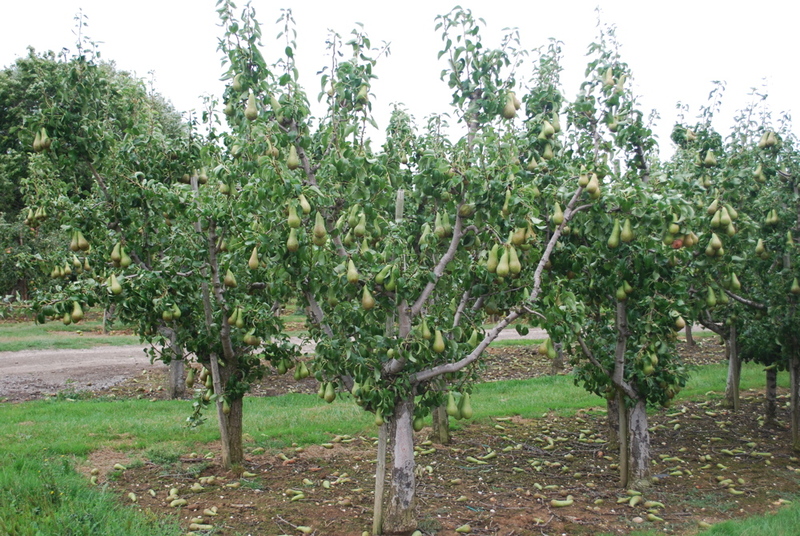 Conference pears should be picked now, or within the next 1 to 2 weeks, left to mature under ambient conditions, preferably somewhere outside under shelter, for about 3-4 weeks. In case one has access to cold storage facilities, longevity may be extended to as long as 3 to 4 months when kept at just sub-zero temperatures. It’s still a little bit early for Conference, I’m only just starting to pick mine now. Yes, they should all be rock hard at the moment, but will gradually ripen in store over the next few weeks without help. Conference is one of those varieties that you need to pick while still hard; if you leave them on the tree until they start to yellow/ripen, you will find the core will have started turning to brown mush by the time the outer flesh is ready. Harvest too early and they will just gradually shrivel up without softening. Iodine solution is still used to determine when to pick apples and pears for storage, along with more sophisticated techniques. You may remember coating a cut potato at school with iodine solution which turned blue black to indicate starch in the potato. When I suggest this to people I am often met with a blank stare either due to loss of memory or that school days were a distant memory perhaps not to be remembered! Apples can be stored at 60% starch, up to 90% for long term storage in gas controlled stores, whilst pears only 30%. The respiring pips use the energy in starch to mature so the centre of the fruit will eventually give a colourless reaction to the iodine, gradually spreading to the perimeter as the fruit ripens. Apples show a clear delineation so are easy to calculate the percentage but pears show a haphazard distribution. I use Savlon spray as iodine is difficult to buy unless being used for commercial use. Those are really helpful suggestions. Thank you. I have so many pears on my tree but can never get them ripe. I tried the bag with a banana but it didn’t work. How should I store them and for how long if I pick them now? Would they be OK in a box in the shed? I have had to pick mine now because birds are pecking them. I puree some and freeze, bake cakes, make pickle and give some away to family and friends. I have made some lovely pear chutney with mine. They are hard, but I can still peel them and chop them up. They soften in the cooking. Also when softish to peel, I cut into slices, poach gently in apple juice and freeze. Delicious on a cold winters day.